Jennifer Darmour, “Ping” and “Zip”. Jennifer Darmour is the person behind electricfoxy, a blog and wearables production platform where she has developed two ambitious gesture-based wearables aimed at the mass market. “Ping” – is a social networking garment which updates your Facebook account depending on how you interface with the hood while Darmour’s most recent piece, “Zip”, is a jacket which lets you control the volume of your music listening device using the zipper as interface. One of the few wearables designers with a key concern for haptic interaction design distributed over networked technologies, her work highlights somatic engagement in techo-textiles innovation. A number of your early projects done while in graduate school at the Art Center College of Design in Pasadena, California focus on getting people to act, move, or interact. For example, “Run” invites participants to create a geographically dispersed race via a networked shoe interface, while “Mix” is a wearable device created to encourage overweight children to move via a gesture-based system to share music. Why the interest in making people “do” things”? I would agree that both “Mix” and “Run” encourage people to act, move and interact for the audience they are designed for. They are grounded in solving a specific social problem such as the growing epidemic of obesity in children (“Mix”) and for specific contexts such as the casual running and fitness community (“Run”). Both encourage people to move and stay active toward better health and fitness. The solutions solve a problem within their context through action. However, both “Ping” and “Zip” look at much different problems. With these projects, I am investigating four areas: the mechanics in the clothes we already wear, the aesthetics of the circuitry, the seamless integration of technology and clothing patterning (no small feat in this space), and how we can efficiently (cheaply) manufacture these types of products. Collectively, these projects help facilitate a continuous learning process with the intention to create a fantastic experience and improve future versions and concepts. For example, with my latest project, “Modwells”, you can start to see how all of this research is applied. From the experience design side, I’m looking at ways to solve a need within a specific context (health and wellness) by applying research and user experience design methods much like “Run”. And from the garment design and implementation side, I’m looking at ways to apply the mechanic’s and aesthetic language that I am developing through “Ping” and “Zip”. Overall, The work I do through electricfoxy bridges user experience design and wearable technology design. It’s an evolving process of learning, experimenting, and creating with the intention to understand materials and electronics properties, how we interact with our clothing, and ultimately, how these types of products can help enhance or augment our experiences. For wearables, the opportunity is around using the platform of clothing in ambient and expressive ways and combining them with other devices (such as a mobile phone) that extend the capabilities into larger ecosystems beyond just our clothing. On electricfoxy you state that “Technology enables a richer connection with people and our environment and offers a new platform for communication and expression.” Do you see wearables as the future of networked communications and how? I wouldn’t say that wearable technology alone is the future of networked communication. In fact, we already carry around with us the ultimate communication device…a mobile phone. Yet, we’re living in a time where technology is becoming more invisibly embedded into our lives and into our environments. A technology-integrated garment is just one device among many that can be used as a form of input and output such as collecting biometric and location data that can be used in interesting ways and provide feedback that is personal and ambient. You can think of it as a “mouse” for our body. For wearables, the opportunity is around using the platform of clothing in ambient and expressive ways and combining them with other devices (such as a mobile phone) that extend the capabilities into larger ecosystems beyond just our clothing. Nikeplus is a great example of this on the market today. The experience isn’t just about the chip in your shoe. It’s about using that shoe to collect the data, which is then used in a larger ecosystem (website, mobile phone) and encourages a new way to connect with your community and share your experiences with your friends. I don’t necessarily question that technology is beneficial, however, do you imagine certain circumstances (dystopian or just cumbersome) where we may not want technology integrated into into our garments? Absolutely. One of the fundamental needs that clothing solves is to simply protect and keep people sheltered from their environment. I don’t think people who are living on the streets care if their clothes have integrated technology. They care about warmth and other fundamental needs. Designing any product and experience is all about context and understanding the needs and desires of the audience you are designing for. Not all solutions require, or should even include, technology. The challenge is to find that “killer app”, the solution that hits that sweet spot between solving a real problem, fitting into the value proposition of the user and the business, manufacturability, and scalability. You are one of the few people working in the field of wearables who also works directly in the tech industry. How does your work experience feed into the wearables you develop at electricfoxy – and why are they not being developed at, for example, Microsoft where you presently work? I don’t work for Microsoft, but I do work with a variety of teams within Microsoft and other large technology companies. There is a lot of this type of work being investigated in large technology companies. The challenge is to find that “killer app”, the solution that hits that sweet spot between solving a real problem, fitting into the value proposition of the user and the business, manufacturability, and scalability. 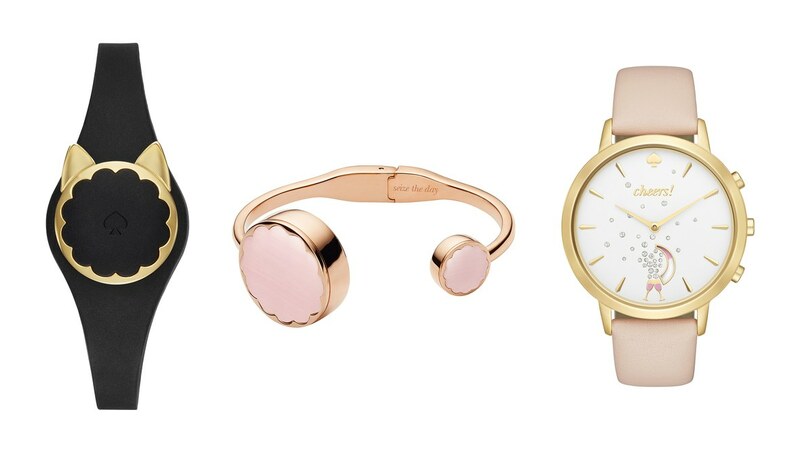 There are so many challenges with wearable technology from the seasonal lifecycle of the fashion industry to the limitations in current manufacturing processes. I believe one of the opportunities for wearable technology is thinking of how tech garments can fit into a larger ecosystem and augment the experience. 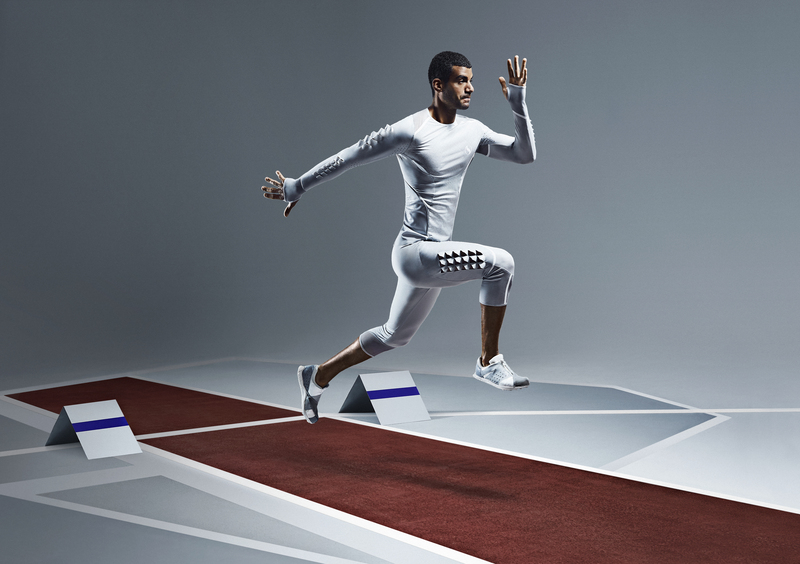 Very few tech garments on their own will be robust enough to be a long-lasting solution. But, combine a tech garment with a phone, software, and other devices and suddenly you have a solution that can add a lot of value to the larger experience and that can be scalable over time. The work that I do in the tech industry applies directly toward this idea. In the case of “Ping”, I was investigating ways in which the garment could connect and augment a larger software system such as your social network. As a solution, the “Ping” garment connects to Facebook and allows you to interact with software that you would normally experience through a website or a device app in new ways. For these projects, it’s not just about the garment, it’s about how the garment can fit into and augment the larger ecosystem and experience. Can you tell us a bit more about electricfoxy, and why you set it up? What would best describe it? Blog? Research platform? Production studio? Or all, and how? Electricfoxy is all of those. The intention is to create a platform for discussion, to share ideas, investigate, and to change the way people think about wearable technology in general. With new eTextiles and smaller and cheaper electronics, wearable technology is no longer the “Steve Mann” solution. We can now truly integrate technology into the fabric of our lives, making it invisible, beautiful, expressive, and meaningful. Ultimately, I try to keep electricfoxy as fluid and open to new ideas as possible with no limitations within an environment that encourages experimentation and invention. All of the electricfoxy projects are developed at electricfoxy. What technologies do you have at your disposition, and are the wearables you make developed at electricfoxy? How does the access to technology (for example I noticed you used the LilyPad for “Ping”) shape the kinds of wearables you produce? From a prototyping perspective, the Lilypad platform is a great way to do “experiential prototyping” for wearable technology. It allows you to dive in and start building cheaply and quickly, so you can get a sense of how the experience feels and immediately start to improve it. I use this platform often to test my designs. Ultimately, I try to keep electricfoxy as fluid and open to new ideas as possible with no limitations within an environment that encourages experimentation and invention. All of the electricfoxy projects are developed at electricfoxy. The studio is set up to tinker, play, make, fail, troubleshoot, inspire and envision. My studio is full of materials, electronics and technology that I am constantly experimenting with. 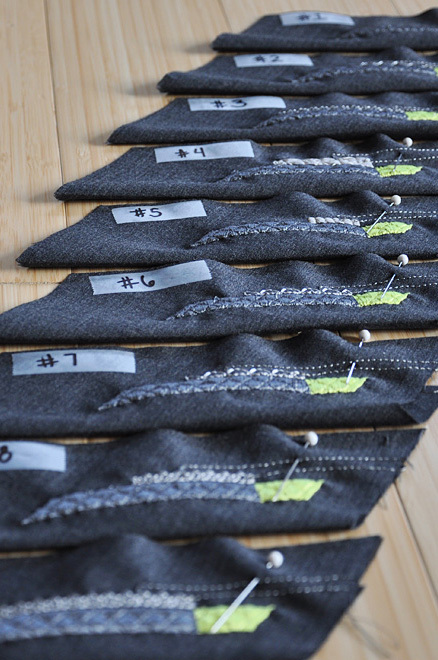 Some projects are inspired through investigating a material, such as “Zip” which uses soft and washable embroidery as the circuit rather than hard electronic components. And some projects are designed from the opposite angle such as “Modwells”, which began with research into a specific context and solves a user need. Can you describe, from a technical point of view, how “Ping” and “Zip” function? The “Ping” prototype combined hardware and software using the Lilypad Arduino, Xbee, Facebook APIs and custom software. For the hardware, the Lilypad, Xbee and sensors were integrated into key areas of the garment. For example, a bend sensor was integrated into the hood, which sensed whether the hood was lifted up or down. On the software side, custom software was written to track the use pattern such as keeping track of how long it was in either position and how many times the hood was lifted. A small vibe board was integrated into the shoulder of the garment that provided haptic feedback when you received a message from Facebook. Software was written for this as well, which allowed for the garment to “talk” to Facebook and send a “tap” when a new message or comment was made. The software also allows you to customize the tap pattern based on who is communicating with you. This allows the users to essentially create their own, invisible communication language. Because I am also interested in the aesthetics of the circuitry, rather than hiding all of it, I exposed portions of it along the side panels, which became both functional and beautiful. 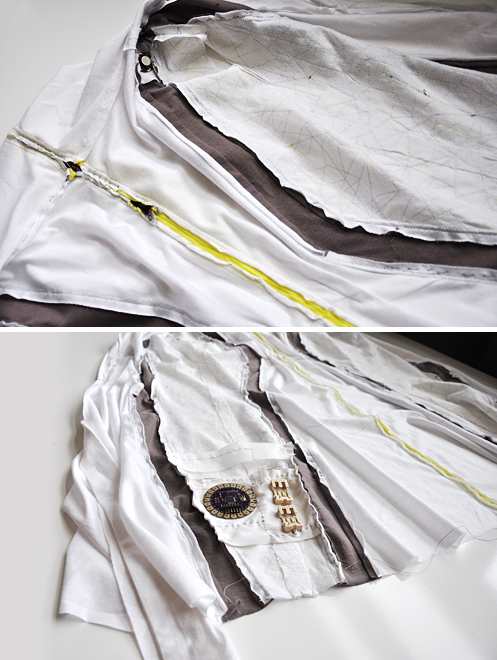 Jennifer Darmour, Lilypad and sensors embedded into the outer layer of the “Ping” garment. “Zip” was created with the intention to manufacture, so I simplified the technology significantly by focusing on one function only that required no battery, IC, wireless connectivity or software. This allowed me to focus on the patterning and how to integrate the technology from a manufacturing standpoint. The technology includes a series of embroideries made out of different conductive threads depending on their properties. The embroideries were then connected into a zipper that controlled the volume of the connected device, for example an iPod. Jennifer Darmour, “Zip’s” embroidered and functional pleats. Do you collaborate with technologist/designers, and if so, how? Absolutely. Creating wearable technology garments is a very new and complex process that requires many disciplines and industries to come together in harmony. And the disciplines/industries such as electrical engineering and fashion design don’t necessarily have a lot of experience in each other’s worlds. There are many challenges collaborating across disciplines. Defining methods to communicate/collaborate effectively is also part of what I do at electricfoxy. Jennifer Darmour, technology/material explorations at electricfoxy studio. Can you further describe which parts you are “hands on” involved with and which parts of the development you are collaborating with fashion designers or engineers/programmers? Overall, I am hands-on for all phases including research, conceptualizing, prototyping and construction. However, most of the ideas require deeper knowledge into specific disciplines such as electrical engineering, fashion design and pattern making. This requires careful collaboration, which is also a very exciting part of creating these types of projects. For example, with “Ping”, I worked with a developer on some of the custom software that was required to customize a Facebook application. And for “Zip”, I collaborated with an incredible apparel designer who offered her expertise in fabric behaviors and pattern making for manufacturing and was hands-on with the garment construction. Again, she was focused on garment patterning, which allowed me to focus on how to seamlessly integrate the technology. Both collaborations required an understanding of their own processes and how they could be augmented toward a truly seamless integration. Ultimately, I think it will be up to the wearable technology designer to help bridge those collaborations toward a common vision. I’m a huge believer that being nimble in the design process and rolling up your sleeves to “test often and fail early” is essential for designing these types of products. Your designs are very aestheticized and make use of the actual garment to function (gestures, zippers etc). How much do the technologies used in wearables influence the final design? And how do you work around technical limitations? I’m a huge believer that being nimble in the design process and rolling up your sleeves to “test often and fail early” is essential for designing these types of products. Since the technology is so new and we are still at the cusp of understanding its potential, each project is an evolution where all the phases of the design process influence each other. For example, with “Zip”, the test circuit that functioned great on the test board didn’t work at all once it was integrated into the draft garment. Some of the initial textiles didn’t allow the embroidered pleats to fall correctly when worn. I had to work with a fashion designer who had expertise in fabric properties to find one that would fall and drape properly with technology. In the end, the new fabric influenced the pleat patterning and overall aesthetics. In both projects you use soft circuitry – how did you work with these? On professional embroidery machines? 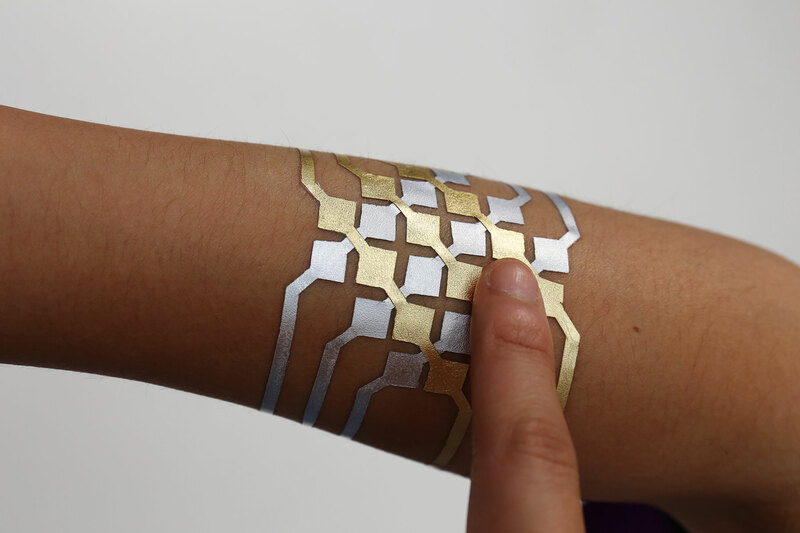 And do you see the integration of soft circuits as the future of wearables? For both “Ping” and “Zip” I used both a professional embroidery machine along with a home machine. The home machine allowed me to test and experiment cheaply and for longer durations of time. I then used a professional embroidery machine to test the embroideries and to understand the limitations of manufacturing. For example, with “Zip”, the original pleats were intended to be created with one embroidery and in one pass. But on a professional machine, the design needed to be broken into individually embroidered pleats in order to be manufactured more efficiently, which changed the overall garment pattern. For soft circuits, I don’t think this is the future of wearables on its own. I do, however, think that eTextiles and soft circuitry are a natural progression for wearables and allow technology to be integrated into products that have similar properties. How long did “Ping” and “Zip” take to develop form the idea to the product? Since this field is so new, these types of projects take a significant amount of time right now. Designing both “Ping” and “Zip” required a lot of trial and error, where each improvement required new prototype to be built form scratch. And since I was collaborating with other disciplines, there was more time involved with setting the vision, communicating, and working toward a common goal. Wearable technology is still a very new idea for most markets. A lot of people associate geek-wear, large ugly components bolted onto clothing, and the aesthetics of science fiction with wearable technology. You say that “Ping” aims to “generate market desirability” – and I know both “Ping” and “Zip” received quite a substantial amount of press – were you also successful in tangibly marketing the wearables? My projects are not about generating press, they are about changing the way people think about wearable technology. Wearable technology is still a very new idea for most markets. A lot of people associate geek-wear, large ugly components bolted onto clothing, and the aesthetics of science fiction with wearable technology. I wanted to create a design practice that encourages change in the way people think about wearable technology, “re-band” it, and inspire acceptance and desirability within a wider audience. Have you sold any? And if so to whom? Or is the goal to inspire existing markets? I do not offer any of my products commercially at this time. However, I am getting a significant amount of requests and feedback, which is a good barometer on current market potential and what types of solutions could lead to a successful launch. Why kinds of platforms have you used to showcase your wearables (i.e. on runway, news platforms, galleries, performances)? Right now my focus is on creating projects and refining the design methodology. I would love to share this work in new platforms along with future electricfoxy projects. For what context(s) do you imagine your designs to be worn? For the everyday? Or just special occasions? Is the technology, for example, robust enough for day-to-day use? And if not, what kinds of allowances do you make for technological “vulnerability”? It really depends on the context and audience for which they are designed, which is different for every project. “Ping” is designed for a fluent social networking women, which could be worn by any woman who uses Facebook and emotionally connects with the aesthetic of the garment. “Mix” was designed for kids and “Run” was designed for casual runners. I can imagine specialty couture such as Cute Circuit’s red carpet dress for Katy Perry or Anouk Wipprecht’s garments for Black Eye Pea’s Super Bowl performance. These are not intended for everyday use at all. In the end, it really depends on the context and the audience for whom these projects are designed for. You can think of it as a similar experience as changing your settings on your phone. You mention that for the “Ping” garment individuals can create their own “tapping rhythms” – can you describe this further, how it works, and how it is applied? A lot of software out there includes APIs that allow you to change and integrate other devices and experiences into them. In the case of “Ping”, I used Facebook APIs and custom software that allowed the Lilypad and Facebook to communicate to each other. The custom software also included an interface that allowed you to customize the experience such as changing the garment’s feedback pattern. You can think of it as a similar experience as changing your settings on your phone. How is the customization of the taps achieved? What is the interface? You can think of it similarly to adding an app in Facebook and changing the settings of that app. However, there was custom software that was written to get Facebook to “talk” to the garment and visa versa. In the end, this was an experiential prototype, not intended for manufacture at this time. Not yet. Right now, I have built only one prototype. This would be a fantastic way to continue testing and improving the experience and I also love the idea of connected tech garments working together. Perhaps this is worth exploring. Rather than replicating controls intended to be interacted with on a hardware device, I considered the clothing mechanics and explored new ways to integrate them into the gestures that we already perform with our clothes. I was excited to see “Zip” as mp3 player interfaces were one of the first marketed “wearables”, such as the collaboration between Apple and Burton to create the iPod integrated “Burton Amp Jacket” (2003). How is “Zip” different from other main stream music interfaced clothing of the past, and why? The difference is the interaction, aesthetics and context. The Burton jacket was designed to listen to music while skiing or boarding. “Zip” is created to be used anywhere. And a lot of mp3 integrated garments replicate the player controls on the garment. With “Zip”, I wanted to explore different ways to interact with the player controls, beginning with the volume. Rather than replicating controls intended to be interacted with on a hardware device, I considered the clothing mechanics and explored new ways to integrate them into the gestures that we already perform with our clothes. Can you tell us more about the development of “Modwells”, its applied use, and when we can expect it to be launched? The project is focused on the topic of healthcare and takes an integrated approach to the design that combines technology garments, industrial design and software. Right now I am designing the experience, which is a large and scalable platform. And the team that I am working with at Artefact has only scratched the surface with the concept and implementation. You can read more about the research and where I’m at with the concept here. I would love to get your feedback! In fact, there is something almost seductive about the gesture of unzipping to turn down the volume as you prepare for a more intimate conversation with someone. I know you are interested in gesture-based interfaces, however would you characterize “Ping” and “Zip” as “performative”? Yes, that makes sense. In fact, there is something almost seductive about the gesture of unzipping to turn down the volume as you prepare for a more intimate conversation with someone. You could define this as performative. How do you see the interactions at play between the body, technology and fashion in your designs? It’s all about finding that perfect harmony among all of these. Since these types of products include clothing and accessories, then fashion has to be considered, which comes with its own set of problems to solve. And if it’s a product that is worn against the skin and on the body, then body mechanics have to be considered. In certain contexts, yes. For example, I can see wearable technology applied to many sports performance situations that help athletes train and optimize their performance. I can also see these types of experiences in healthcare such as the case of “Modwells”, that helps us collect biometric data and ultimately influences our health and body behaviors.